Tokyo, July 20, 2018 – Subaru Corporation signed an agreement on implementation of forest conservation activities with the Bifuka-cho municipal government on July 6, 2018. As part of the Subaru Forest Project,*1 the agreement aims to promote forest and environmental conservation in Bifuka-cho, Hokkaido, Japan. In Bifuka-cho, Subaru has the Subaru Test & Development Center Bifuka Proving Ground (established in 1995 and occupying a 361-hectare site), where it conducts a variety of vehicle development tests on facilities including the Advanced Driver Assist Technologies Test Tracks*2 that began operating in 2017. 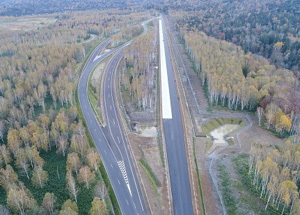 In June 2017, Subaru launched the Subaru Forest Project, starting with the first-step activities including tree-planting, forest-thinning and nature conservation programs in a forest of about 115 hectares on the Bifuka Proving Ground site. 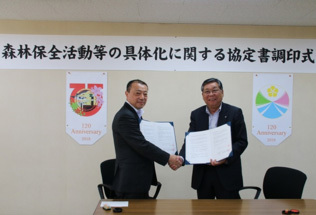 With a view to expanding the project into one that involves partnerships with Bifuka-cho and other local communities, the Company signed a basic agreement with the Bifuka-cho municipal government on June 19, 2017 and has since examined and discussed specific activities. 1. Gain Group Forest Certification*3 covering a wide area to exercise sustainable forestry practices for the common good in the aim of preserving the global environment. 2. Utilize the J-Credit Scheme*4 certified by the Japanese government to promote carbon sink measures through appropriate forest management. 3. Collaborate in the annual tree-planting event organized by Bifuka-cho as part of efforts to conserve forests, encourage planting, and promote tree-growing. 4. Support environmental improvements at Matsuyama Marsh,*5 a local tourism resource. 5. Supply surplus timber from forest-thinning in forests owned by Subaru for use as fuel in wood-burning biomass boilers. The Subaru Environmental Policies, revised in April 2017, declare, “The earth, the sky, and nature are Subaru’s fields of business.” Subaru considers that preservation of the ecosystem of our planet—the earth, the sky, and nature—in all business activities is of utmost importance to ensure the future sustainability of both society and the Company. The Subaru Forest Project is one of the key specific initiatives that the Company has launched based on the Subaru Environmental Policies. In the aim of creating a sustainable society, Subaru will continue its efforts to contribute to improving society and the environment. *3: Through independent third-party certification of appropriate forestry management and labelling of timber and products from certified forests before distribution, forest certification encourages buyers to choose sustainable timber and supports sustainable forest management. Group certification enables several forest managers to form a group and obtain certification together rather than singly. *4: Under the J-Credit Scheme, the government certifies the amount of greenhouse gas emissions (such as CO2) reduced or removed by sinks through efforts to introduce energy-saving devices and manage forests, as “credit.” Credits created under the scheme can be used for various purposes, such as achieving the targets of low carbon society initiatives and carbon offset efforts.